Developing countries, including those in the Caribbean, are urgently seeking to identify new moorings in the post?Cold War world, which is characterized by complex new economic and sociopolitical challenges. 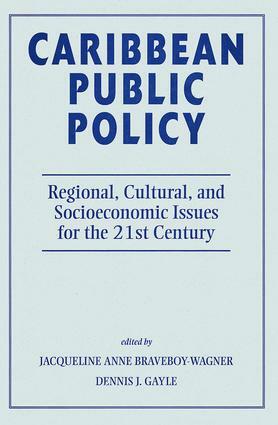 Caribbean countries must now compete for investment capital and markets while striving for social equity, maintaining representative democracy, and preserving the environment.This book offers a comprehensive overview of public policy issues in the region, looking in particular at these important themes: economic policy, the regional business environment, regionalism and integration, higher education, health care, labor and migration, gender, drug abuse and narcotrafficking, the environment, telecommunications, and science and technology. The contributors, all eminent representatives from the English, Spanish, French, and Dutch Caribbean, bring together culturally diverse viewpoints and address issues with a refreshing directness, assessing realities, challenges, and possible futures of the Caribbean.